When I posted online about these giveaways, Craig Welburn of PyxWise Software contacted me immediately to ask if his company could participate. He was generous to donate a code for each of his spelling applications. 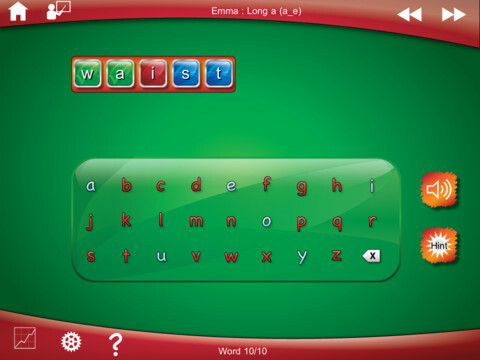 The Simplex Spelling applications all provide spelling lessons, assistance along the way, and tracks data on students. Continue reading for my review of these applications as well as a giveaway of each one! All three applications require use of a User account. The applications are slightly different in regards to the button to begin creating an account/find menus. On the Simplex Spelling Phonics 1 and Simplex Spelling HD applications, press the person with a "+" at the bottom of the page. On the Simplex Spelling Phonics 2 application, press the down arrow and then the person with a "+" sign. Press "Create User" to add a new user to the list and type his or her name using the keyboard. To delete a user, highlight his or her name and press the "Delete User" button, then press "OK". Press "Rename User" to edit a person's name. 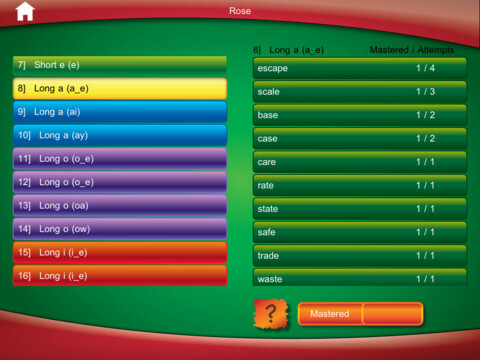 Press "Select User" to choose the user to play the application. Pressing the "Progress" button (chart) on the main page of any of the three apps will bring you to the selected students' progress page. Choose the word list to view by pressing its button on the left. On the right, you will see words mastered and how many times each was mastered out of the total of attempts. Slide the switch at the bottom over to view words that have not been mastered yet and will be practiced on their own (unless you press "Restart List"). Press the gear button to go to the settings page. 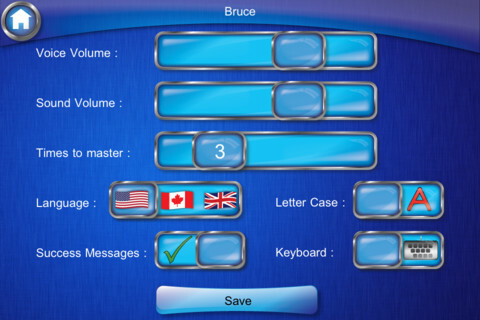 Here, you can adjust the voice volume via a slider, sound effects volume via a slider, the amount of times a word is required to be spelled correctly before mastery, the spelling language (US English, Canadian English, or UK English), turn success messages on and off, choose uppercase or lowercase letters, and decide between an alphabetic or QWERTY keyboard. Press "Save" to keep your settings. Pressing the "i" button will show the developer, their website, and the version of the application. Each of the applications begins with an Introductory spelling list to introduce students to how to use the application and its features. The lesson/letter(s) to be focused on in the selected spelling list will appear in the middle of the screen. You can slide a switch back and forth to show scores or not during play. Pressing the teacher button will replay the directions. Pressing the double-arrow button will begin list play. Then, a keyboard will appear in the middle of the screen. There will be boxes at the top of the screen relative to the length of the word. Each box represents a letter in the word. The narrator will state the word to be spelled and use it in a sentence. To hear the word stated again, press the microphone button. Press the letters in order on the keyboard to spell the word. If all of the letters are correct, they will appear in green and the user will be able to press the "Next" button to move onto the following word. If success messages are turned on, a positive reinforcement message will appear on the screen which a user can press to hear it stated aloud. If the letters are incorrect, they will appear in red. If a letter is incorrect in its placement, but it is in the word elsewhere, it will appear in blue. Pressing the backspace button on the keyboard will allow the user to delete the previous letter. 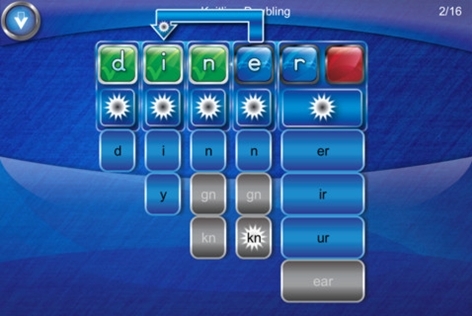 When a user needs help spelling a word, he or she can press the "Hint" button to view phonics help underneath each box for the spelling word. 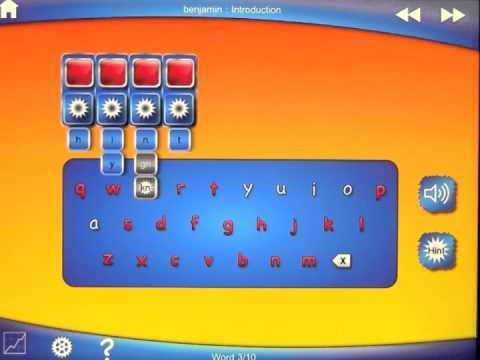 Pressing the blue phonics buttons will show options for the sound that fits in the box to spell the word. The sound will be stated aloud. Possible sounds to go into the corresponding box will appear below with the most accurate one being highlighted in blue. Press the letter to select it. To spell words, there are three different ways. You can type the letters in order, click and drag letters in any position of the word, or press the "Hint" button and select the sound that best fits. If a word is incorrectly spelled, you can click and drag letters to the left or right to place them in the correct spot. At the end of each lesson, the student has the option to play it again by pressing the paper with an arrow around it or play the next lesson by pressing the paper with two arrows pointing to the right. Press the "Home" button if you would like to return to the Main Page. The words are stated aloud, stated in a sentence, and then stated again. Then, students can have the narrator restate the word again by pressing the microphone button. This is perfect for students who have difficulty reading or need the word restated! Hearing a word in context helps as well. Plus, hearing the word stated aloud helps the student hear the sounds in the word. Hints, especially the sounds that may fit within the word that all make the same sound, are very helpful to students to help them learn about phonics. Visual colors on the boxes of the word are great to help students realize which sounds are correct and incorrect. The fact that there are so many different words to spell and so many lists, categorized by common features or sight word lists, each adding more onto the last, is helpful to teachers because it provides access to so many lessons and word lists for their students to practice. Being able to change the settings is great for people who have different needs. It is great to see the progress of students saved onto the application divided into individual words on lists and whether or not the words have been mastered or need additional practice. It is also wonderful to have the ability to save student profiles onto the applications because it saves a lot of time in tracking student progress. I would love for the ability to e-mail a students' progress on word lists. Receptive Language - Words are stated in a sentence on the application. Have students define the word based on the context clues. Expressive Language - Have students write sentences different than the ones stated for words with the word in a sentence. Have students create a sentence or story using as many of the words on a word list as they can. Articulation/Fluency/Voice - Have students state the words aloud or in a sentence using appropriate speech sounds, fluency strategies, or vocal strategies. RtI - Play the word list that matches the phoneme being focused on. Play the lesson and discuss the sound the letter makes. Have students think of other words with the sound in them. Simplex Spelling Phonics 1 and Simplex Spelling HD are both available for the iPod Touch, iPhone, and iPad for $4.99. 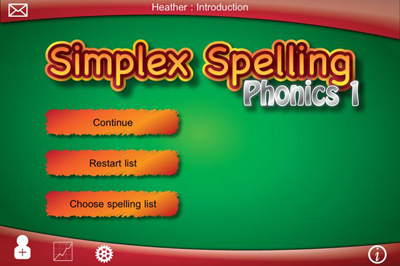 Simplex Spelling Phonics 2 is available for $2.99 on the iPod Touch, iPhone, and iPad. There is also a Lite version of the applications for free. 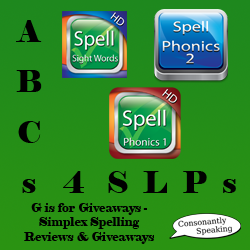 Consonantly Speaking was given a copy of each application to give away with this review. No other form of compensation was given. Enter the giveaways below for your chance to win one of these applications!